Construction has finally begun on the twisting tower on West Georgia, located just across the street from the Shangri-La Hotel – Vancouver’s tallest building. The tower, now under the Trump brand, was originally proposed in 2007 but was shortly canceled when the recession began to take its toll on the real estate and financial markets. The site has sat vacant as an incomplete construction site ever since the 1990s. 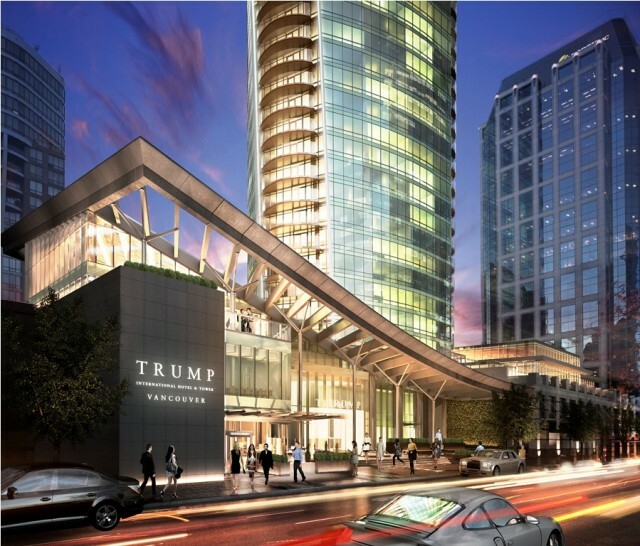 Situated on Georgia Street in Downtown Vancouver’s Coal Harbour, Trump International Hotel & Tower Vancouver will include a hotel and residences. In addition to 147 guest rooms, the luxury hotel will include a champagne lounge, signature restaurant, banquet and conference centre. It will also be home to Vancouver’s first pool bar nightclub and Canada’s first Mar-a-Lago Spa by Ivanka Trump, a new boutique spa brand that will reflect the joie de vivre of the timeless 1927 Palm Beach property. Above the hotel will be 218 stylish residences, offering residents spectacular views of the North Shore and beyond. The original twisting design of the tower maximizes the window features and views in every suite. And because of this unique design, every unit is distinctive with no two views exactly alike. Attention to detail and personalized service will further differentiate the development. Residences will range from 644 to 2,117 square feet with the penthouses between 3,500 and 4,400 square feet. Sales for the residential suites will begin in October 2013 with project completion expected in the summer of 2016. It will generate 300 full-time job positions upon opening and it is expected that visitors to Vancouver will occupy 40,726 room nights per year.